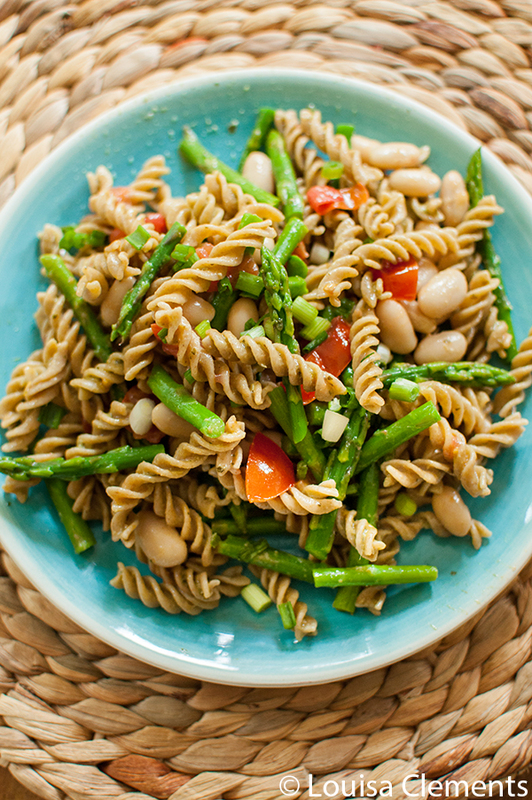 Try the Italian favourite of adding beans to pasta by tossing pesto with pasta, asparagus, white beans, tomato and green onion for a light and healthy spring dinner for asparagus and white bean pesto pasta. It’s hard not to be inspired by the warm weather and fresh, in-season ingredients like asparagus. Just seeing them in the stores makes me excited about all the spring and summer recipes I have in the works. Seriously, just look at the gorgeous colours in this asparagus and white bean pesto pasta. It’s like spring on a plate. I don’t know what it’s like in your part of the world, but in Toronto it’s been a much cooler spring than normal. It’s making me a little nervous about what this season is going to be like for fresh local produce, but I’m sure by the time June rolls around we’ll have a ton of fresh produce. But, even though it has been cooler, this weather is not always a bad thing because I feel like it has made these past few warmer and sunshine-filled days even nicer. I think we have a bit of that “You can’t appreciate what you’ve got until it’s gone” kind of thing going on here. In my search for moments I think I’ve started overthinking things more than normal…which is probably not a good thing. Ha! We can talk about that overthinking thing another time. This is a recipe for a simple, vegetarian pasta dish that can be eaten warm or cold, it’s pretty versatile that way. Just the way I feel like most recipes should be, versatile. A warm spring pasta one night and a cold pasta salad for lunch the next day? It’s kind of the perfect meal – built in leftovers. I cooked this up earlier last week, just kind of throwing together ingredients that I already had in my fridge (asparagus, tomatoes, green onions, pesto) and in my cupboard (pasta and white beans). This is a great “clean out your fridge” kind of recipe. You could even swap out the asparagus for another veggie like broccoli or even green beans, but with local asparagus in season I knew this dish needed some of its sweet, grassy flavour. I finished this dish off with a squeeze of lemon as the citrus and acidity brightens the flavours of this dish – I often find that if a dish seems a little lacking, a hint of lemon, lime or vinegar will do the trick. The pesto adds a ton of flavour to this dish and acts as the sauce, in combination with the fresh vegetables and white beans I think this meal is a perfect 10. A trick that I use in my kitchen is to always have a jar of pesto in the fridge. It’s a simple and healthy way to make a meal and it’s what keeps this pasta more on the light side and away from the ooey-gooey, cheesy goodness of baked pasta we love in the winter. A great clean-out-the-fridge meal, this vegetarian pasta filled with asparagus and tomatoes is a healthy dinner. With protein from white beans and flavour from pesto, this recipe works well both warm and cold (a perfect spring-time pasta salad). 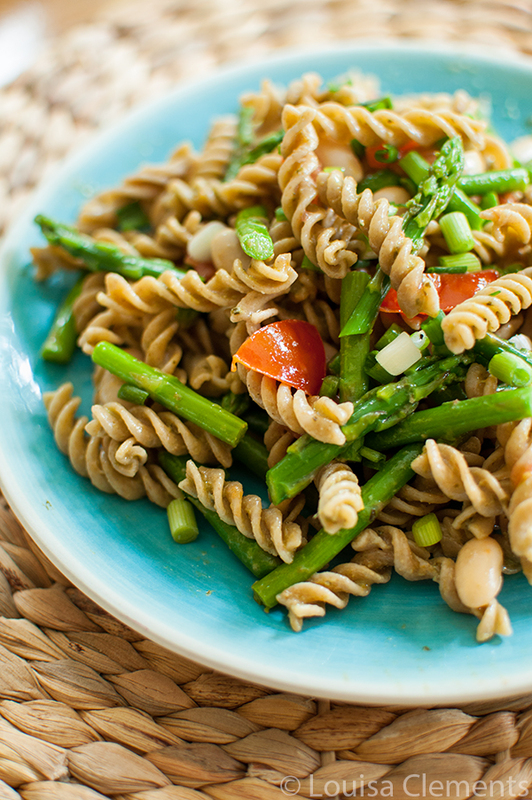 Enjoy the fresh vegetables of spring with this simple, protein packed vegetarian pasta dish. Cook pasta to package directions and toss with pesto. Steam asparagus for 5-7 minutes or until tender. Shock in a cold water bath to stop cooking. Heat olive oil over medium heat in a large pan, add tomato and cook for 2-5 minutes. Remove from heat and toss with asparagus, white beans green onions and pasta. Sprinkle with lemon and serve. Let me know if you try this asparagus and white bean pesto pasta in the comments below. Thanks, Helen! I guess it's true that great minds think alike, haha! What a gorgeously fresh and tasty pasta dish! I so want this pasta on my Memorial Day menu this weekend! Stunning photos. Pinned! I love that you added beans to this salad. It looks so summery and perfect for this weekend's BBQ. Have a great weekend. Thank you, Kathy! It's a great way to get some extra protein in there.